(Office of Her Majesty- Press Department- Amman) Her Majesty Queen Rania Al Abdullah attended today part of a session of the Arab Education Summit bringing together industry experts and government leaders to discuss ways to ensure world-class delivery of education, science, and technology across the Middle East and North Africa region. The summit, taking place in Amman May 6-8, is organized by Arab Brains Network and is being held under the patronage of the Ministry of Education (MOE) and in partnership with the Integrated Technology Group (ITG). The summit groups education and ICT ministers, experts, university heads, teachers, civil society organizations, and international private companies from both the Arab region and across the globe. 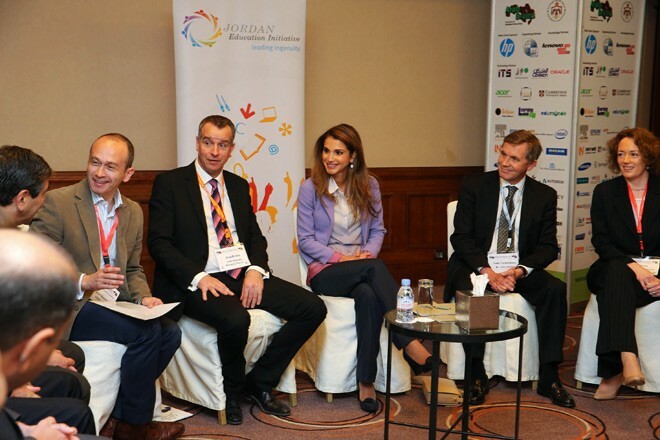 Queen Rania, a keen supporter of education in Jordan and the world, attended part of a session titled "Teacher Training and Curriculum Development" which discussed the most important skills teachers should obtain and how the training process should be comprehensive in linking between the three education elements: teachers, students and the curriculum. The session was attended by Minister of Education Dr. Mohammad Al-Wahsh and Minister of Labor Dr. Nidal Al-Qatameen, and was moderated by Managing Director of Obeikan Education, Mr. David Pottinger. Panelists included Director of the Regional Center for Educational Planning Mr. Mahra Al Mutaiwei; CEO of Princess Alia Foundation and Member of Jordan Education Board HH Sharifa Sara Ghazi; CEO of Queen Rania Teachers Academy Mr. Haif Bannayan; Assistant Deputy Minister for Curricula, Palestine Dr Jehad Zakarneh; Managing Director of Education Training Center, Ministry of Education, Mr. Mohammad Al Zoubi; and Senior Partner &Co Head of the Education Practice, The Parthenon Group Ms. Tamara Butler Battaglino. On the sidelines of the summit, Queen Rania attended a meeting with representatives of international technology sector companies Intel, Microsoft, HP, Oracle, Toshiba, Lenovo, Acer and Samsung as well as education solutions provider JP-IK, to discuss current partnerships and possible future commitments to a number of Her Majesty's educational initiatives, including the Jordan Education Initiative (JEI), Madrasati, and the Queen Rania Teachers Academy (QRTA). “The number one issue for Jordan and for every Arab country is employment and education of our youth,” Her Majesty told the representatives of the companies, highlighting the need to have educational systems that are relevant to the job market in the region. “It is so timely for this conference to take place now to really refocus people’s attention on what is really important ..” she added. “It is so interesting to see that you come together around the issue of education,” the Queen told the executives. “I thank you so much for the promises and the contributions that you make and I really look forward to us exploring areas of collaboration and coming up with ideas that first of all make a huge difference in Jordan, present a case that is measurable for the rest of the world and then replicating it for other countries in the region,” she added. During the meeting with Her Majesty, a representative from Intel talked about an ‘Intel Teach’ program which ensures the use of ICT in classrooms and in creating lesson plans. The representative announced that Intel will also partner with JEI to launch a national 1-to-1 initiative whereby they would start by providing 10 schools with computers, tablets, and other technology. A representative from HP highlighted a new collaboration with JEI aiming to establish an HP “innovation lighthouse” as part of an exclusive group of four global education reform projects. This project will hopefully be announced during a UN General Assembly meeting this September. JP-Inspiring company will partner with JEI to create a reference classroom model in one of the JEI discovery schools; for this, JP will be building a full classroom and fully equipping it with the necessary technology, in addition to providing computers for IT labs in various JEI schools. A representative from Oracle announced 10 internships offered to select JEI schools whereby students undertake a two-month practical training program on using Oracle products. Oracle will also assist JEI and the MOE in an impact assessment study designed to address the critical objectives and challenges in the next phase of education initiatives in Jordan. Microsoft announced that it will also be partnering with JEI and Madrasati by furnishing 68 Madrasati schools with multi-point server technology to 100 labs. This would enable schools to deploy an internet and digital-learning lab from scratch or replace any outdated equipment. The Arab Education Summit comprises of panel discussions ranging from education and ICT infrastructure, teacher training and curriculum development, to vocational training and the reform of higher education. The second segment of the summit will include roundtable one on one meetings between public and private organizations. Approximately 300 people have been invited to this summit predominantly from Jordan, Palestine, Iraq, Libya, Egypt, Oman, Morocco, Bahrain, Saudi Arabia and the United Arab Emirates. Some of the top companies attending include: HP, Oracle, IBM, Intel, Microsoft, Acer, Toshiba, Texas Instruments, Lenovo, Samsung, Dell, Cambridge Press, McGraw-Hill, Macmillan, Corel and JP amongst many others.